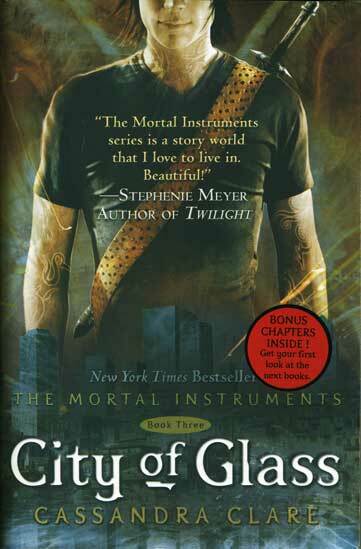 * This review may contain spoilers for the previous books in The Mortal Instruments series. To Sum It Up: Valentine needs only one more Mortal Instrument to destroy the Clave and create his own army of Shadowhunters who will wage war against all Downworlders. Jace and the Lightwoods travel to the Shadowhunter homeland of Idris, where the Clave is assembling to decide how to counter Valentine’s impending attack. Clary is supposed to make the journey, too, but Jace devises a plan that’s supposed to keep her safe in New York. Nothing, however, is going to stop Clary from finding a way to save her mother, and Idris is where she hopes to uncover the key to waking Jocelyn. Review: There’s not much I can say about City of Glass that I haven’t already covered in my reviews of City of Bones and City of Ashes. Now having read all three books for a second time, boy is that one particular series plotline bizarre. If you’ve read TMI, you know which one I mean. Valentine Morgenstern has to be one of the worst fictional fathers ever. Seriously. And yet, despite the mind-contorting family issues, I find this series very enjoyable to read and reread. The world is so immersive, and I’m quite attached to some of the characters (Magnus!). City of Glass sees the setting shift to the Shadowhunters’ oft-mentioned homeland of Idris, which is painted as a place of picturesque beauty, with its glass towers that lend the book its title. In addition to the change in locale, some new faces appear: the Penhallows, the Shadowhunter family who’s hosting Jace and the Lightwoods; Amatis Herondale (Infernal Devices fans will surely recognize that surname! ), Luke’s sister with quite the sad backstory; and Sebastian Verlac—I don’t even know where to begin with him, so let’s leave it there. As for the returning characters, Jace and Clary do their We Wanna Be Together But We Totally Can’t act again. The relationship drama between those two reaches its crescendo, and really, it’s about time because it’s only been at the forefront of the books from the get-go. I did feel a teensy bit sorry for Clary, whom I usually take to task for acting first and thinking second; Jace’s words to her in one scene are particularly brutal. But now here comes the Jace defense: his mind goes to a pretty dark place here, again thanks to Valentine. When you look at all the lives this lunatic has wrecked, there’s hardly a character in the series whom he hasn’t made miserable—or worse. Usually worse. Jace and Simon have traded insults throughout TMI, and I wouldn’t want it any other way. Some of my favorite lines from both are from scenes when they’re sniping at each other, typically over Clary. Simon may not have Jace’s swagger and skill with a seraph blade, but I love that he can hold his own against Jace in a war of words. City of Glass is a lengthy novel and a good number of those pages are all about building up to Valentine’s assault against the Shadowhunters. The payoff is worth the wait, though, thanks to all of the action that goes down as the book nears its close. The battle is waged on multiple fronts, and it’s almost painful to leave one to check in on another because you’re invested in the outcome of all of them. And that’s always been an area in which TMI shines: the Shadowhunters don’t merely talk about being fierce warriors; they prove it with every demon they strike down. All in All: If you enjoyed the previous books, you should be quite satisfied with the resolution of the major plotlines here. Seriously- I don't know where Valentine got his parenting "skills" from. And he was convinced that he was right-about everything! I felt really, really bad for Jace in this one; so much damage done to him by Valentine. If the series had ended here as it was originally supposed to, I would have been happy with this conclusion. The scene at the lake was pretty epic! I just completed the last one of the series and will have a review up soon. This one remains my favorite one so far. I think it's because everything is just SO intense. I felt so bad for Clary as well, though like you said before I was shaking my head at some of her actions. In the beginning half of this book, I couldn't help but feel for her. Fantastic review! Jaclyn @ JC's Book Haven. I'm excited for your review of City of Heavenly Fire! I'm about halfway through right now and loving it. I didn't think I'd be overly sad about TMI ending, but CoHF is definitely making me feel otherwise!